We all watch movies but rarely do we pause to think just how those movies were created. It’s the culmination of a large team of specialists and a production designer is an irreplaceable part of it. But what if you don’t have the resources right now? Don’t worry, we’ve got you. Here are 10 tips for production design on a budget. If you’re devoted to your film and want it to succeed, the first tip is to acknowledge that production design is a priority (don’t deprive your audience). Great production design is an aid to storytelling, mood, aesthetics and is an integral part of your film. A professional production designer is someone that is responsible for the visual presentation and artistic concept of a film. In a perfect world, this is a person you definitely need on your team. They will add an artistic touch that will bring unity to a production, making your film memorable and impactful. The first obvious place to look when you’re on a budget is to location scout where you can shoot for free or close to no costs. To limit your spendings, find locations in your city and save money on long trips. Concentrate on getting the right location that will bring your vision to life and not a location that is popular and recognizable. You’d be surprised how many great places are available to you. If you’re shooting apartment scenes, rent out apartments for the duration of your production! It can become a place to store your equipment and potentially a great place for naps. During the production of Anna Karenina, production designer Sarah Greenwood turned a theater into dozens of different sets for the movie. This saved tremendous costs when shooting the film because the alternative was to fly the crew out to film at the other side of the world. The complexity of your project depends on the set that you need. There is no way of knowing what your production design will cost you without getting professional advice. For instance, you can hire interior designers and convey the environment you'd like to create. They can advise you on how to deliver a cost-effective solution and further explain the type of work that will need to be done. Consulting professionals will save you additional costs long term. After you have a better understanding of what you will be needing to bring your vision to life, it's time to hire someone that can do the work for you. Set designers can be expensive, however an overlooked resource is recent university graduates that are looking for job experience. The city where you’re shooting likely has production or set design graduates that are more than willing to volunteer. Allow someone to help you and help them out in return. You can find production designers through websites like ProductionBeast and Film and TV Pro. When your resources are limited, you have to get creative. You might not be able to afford a production design team, but hiring even one professional that knows what he or she is doing will be enough to help you in your endeavors. You can hire one set designer and get additional help from your crew. Building sets can be a lot of fun and having a professional on board will help you avoid a tacky design. Karl Hopf wrote an excellent article about creating a gothic set in a modern apartment. With the right visuals and the right camera perspective, you can achieve the impossible. Something that will make you feel more optimistic about your ambitious projects is that stage designs are 75% lighting. This means that with the proper equipment, you can make your sets look expensive even when they’re not. When you’re on a tight budget, choose to invest strategically. Lighting equipment is key and you can easily rent it without purchasing. Great lighting can alter an ordinary set into a dynamic environment and set the perfect mood for your shots. Producer Stephen Boatright had a tight production budget for his film Emmeline Muffet Gives Up Her Tuffet and set designer Lune Bateaux built the set for $1,200. Considering the financial constraints, the team still made it work. Look at how lighting alters their artificial set. Props are an important part of the set because the details communicate the time period of your setting. With significant funding limitations, you have to get creative about where you find your props as well. In fact, most productions rent their props or purchase them at local or online stores. Pay attention to the props, how you use them and find smarter ways to get your hands on the right ones. Details are a powerful tool in a production of any size. Director Sean Meehan teamed up with a set designer, Riley Fearon, and transformed a set to different time periods on a budget of $300. A set designer is usually very resourceful and this example goes to show how a professional can work with any budget and deliver outstanding results. The next best thing to hiring help with production design is thinking about your angles and compositions down to the single frames. How you approach different camera angles will have a big impact on your audience. Depending on the type of set you’re working with, consider all the creative angles that you could shoot from. This will give you more control over your film and ultimately aid your production design. One of the many things a production designer would do is create a mood board or a lookbook to match the aesthetics that you're going for. Save yourself time and money by doing this yourself. You don’t have to have mad artistic skills to create look-books, mood boards. You know better than anyone else the kind of look you have envisioned. To do this, you can find fitting images and piece them together to show the set designer exactly what you want. A great tool that you can incorporate into your work is using the image collection at Depositphotos, which is a diverse stock photo bank that allows you to download high-res stock images and use them for mockups. If you're budget is so limiting that you absolutely cannot afford to hire professional help for production design, consider raising money. When it comes to independent film financing, we’re lucky to have crowdfunding options in the digital age. Social media is a powerful tool, especially crowdfunding platforms like Kickstarter, Indiegogo and Seed&Spark. The actual process of raising money requires effort and excellent planning. You need to have a good understanding of how much money you need to raise and in what time frame. Be smart about how you approach this. If it is production design that lacks the necessary funding, emphasize that in your strategy. Meticulous planning is just part of the process. Make sure you plan all your moves and have an accurate and clear schedule for everyone to follow. The reason why this is important is because overtime work will cost you more money and in truth, bad planning is one of the main reasons productions go over budget. Start filming only when you have a plan in place, one that is reasonable, accurate and efficient. 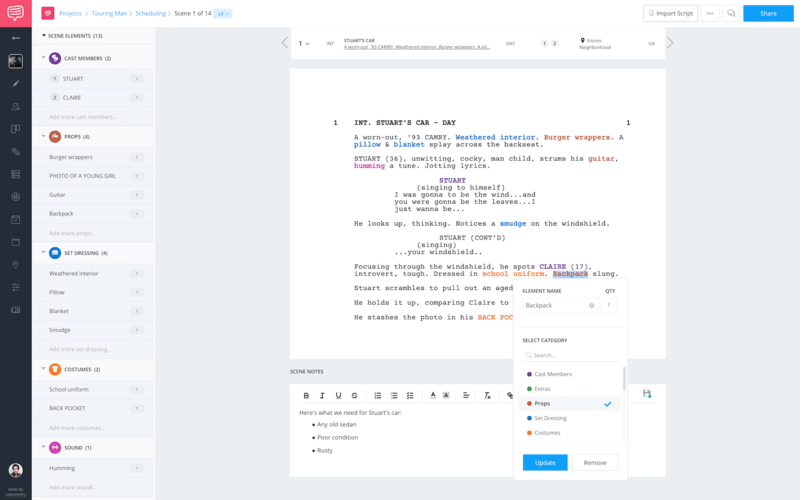 If you're breaking down a script, a scheduling solution like StudioBinder can help you easily identify production design elements and share it with your team. In film school, production designers joke about the actors being ‘the talent’ because audiences recognize the famous actors but little credit goes to the team of professionals that put together a production. Production design requires a separate set of skills. You should never underestimate the power of aesthetics and the transformations that professionals can bring to the table. Tasteful set design and proper lighting can elevate any low-budget film and make it Oscar worthy. You might think your viewers are more involved with the story, but you’d be surprised at how many judge films on aesthetics alone. An aspiring artist, photographer and a writer in the making. I studied set design at the University of Arts London and transitioned into copywriting when I found my passion. I currently work at Depositphotos, a place that allows me to grow professionally and learn about all the subjects that fascinate me. I appreciate how you pointed out that stage designs are 75% lighting. Lighting can really make a difference in studio facilities to help make scenes look better, and it’s good to know that you can rent rather than buying lighting equipment. If I were to ever make a movie, I would try to get a good studio and proper lighting for the shoot. think you could probably answer. I was wondering, Can a web designer/developer use ‘free’ bootstrap templates to make a website/web app for a paying client? Not sure. Web design isn’t my strength, and this article refers specifically to production design in filmmaking. It makes sense as this article has nothing to do with web designing or app creation at all. Although, apps with streamlined content would be a great addition to production design to checklist off materials, props and goal settings during build up. Glad you found our article useful!